The initial idea was to make a refreshing new city shopper, if that was possible at all, but as more and more ideas came I decided to shift towards something different, though the general squarish style is the same and you can find some elements from well-known city maps. So without further ado, I present The Complex. Again I try to promote flying over rope spamming, as well as playing with background on. Thanks to Genre for his alt-route fly maps which helped come up with part of the map. I wanted to finish this map because of all the fun to be had with creating details. And so that's what I did. 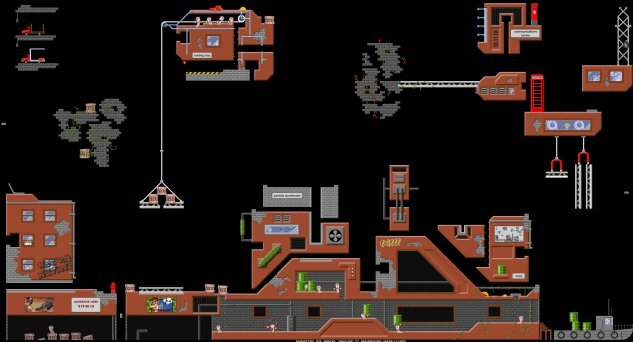 Most of the map consists of custom sprites there to create that industrial and mundane feeling, while the layout focuses on promoting flies, sending animate weapons on walks, and blasting worms into oblivion. I tried to implement an assortment of obvious and not-so-obvious hides of varying difficulty and safety. Furthermore, for the first time I created the layout with tricks in mind, although I'm not sure how that went. Favorites: This map is on the favorites list of 16 users.